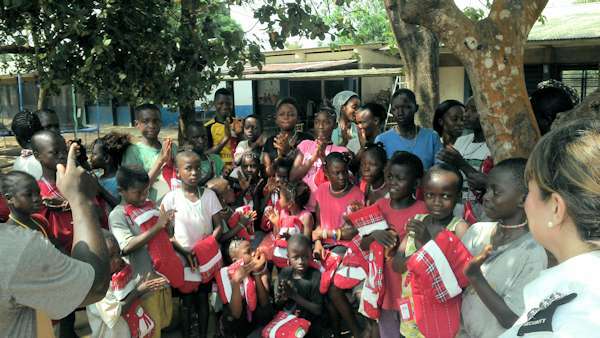 Shortly before Christmas we were able to deliver some Christmas Stockings to the children at Don Bosco Orphanage, along with a donation to the Orphanage to enable them to buy some gifts for the children. 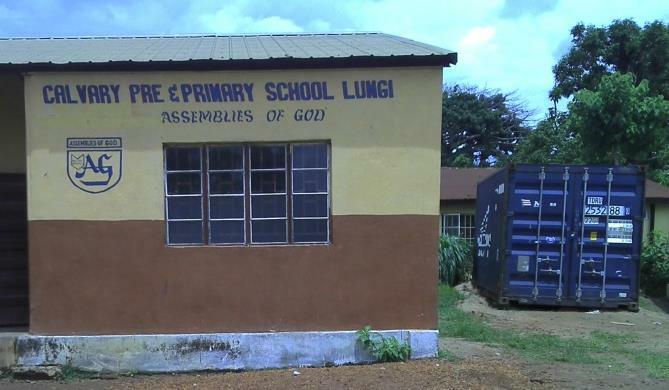 The Orphanage was set up following the impact of the Ebola crisis to accommodate children who had lost their parents to Ebola and is housed in a former school. 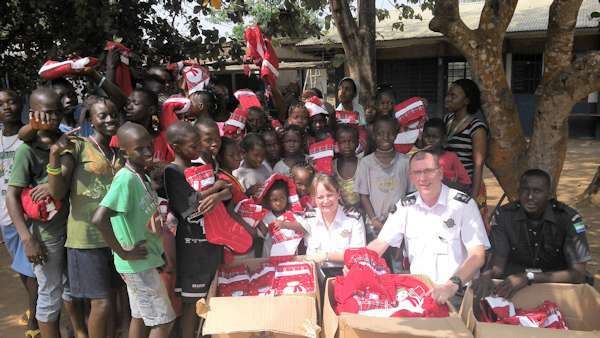 Karen Young and John Drummond from Westminster Aviation Security Services Ltd, visited the Orphanage and met the children and their carers to hand over the donations. 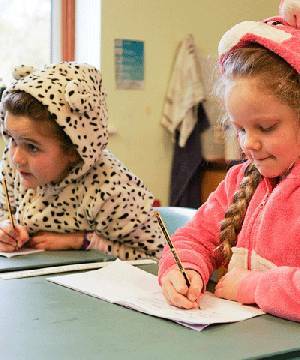 Pupils at Sibford School near Banbury raised a staggering £1115 when they held a ‘Cosy Comforts’ day in aid of the Ebola crisis. 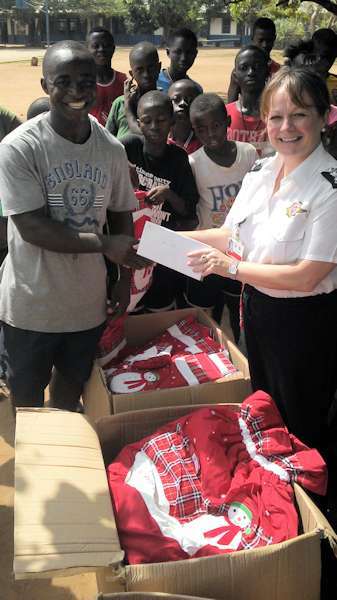 The students paid to come to school dressed in various styles of onesies, blankets, lounge-wear and pyjamas, with all money going towards the Westminster Group Foundation Ebola Crisis Appeal. Alan Wolstencroft visited the school to see pupils in their cosy costumes, to talk about the situation in Sierra Leone and explain how the money will be used. We are very grateful to the Sibford pupils for their generosity towards this appeal. 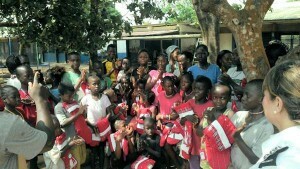 In the ongoing battle to contain and prevent the spread of Ebola it is important to raise awareness amongst communities. In Sierra Leone, Bai Shebora Sheba Gbereh III, the Paramount Chief of Kaffu Bullon Chiefdom which includes the Lungi region, has been very active in raising awareness of his people and in that respect approached Westminster to ask if we could produce awareness T Shirts for the community bearing the slogan “Kick Ebola out of Kaffa Bullon, Sierra Leone”. Westminster were happy to assist and promptly arranged for printed T Shirts to be made and delivered to the community. The Ebola situation in West Africa is now creating a humanitarian crisis on a scale far greater than most people realise with millions now at risk not just from Ebola but from the widespread effects that this crisis has had on the countries concerned. Whilst many thousands have fallen victim to the Ebola outbreak this is only the tip of the iceberg. The fact is that the healthcare and emergency services in these countries are doing a heroic job with many brave healthcare workers giving their lives to try and help treat/contain the outbreak, but the truth is the system is at near collapse. 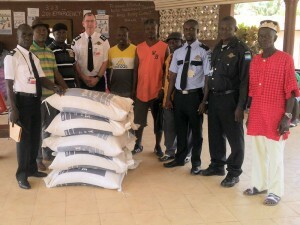 This has, in turn, led to major problems in dealing with other serious health issues and killer diseases such as malaria, tuberculosis and of course HIV/AIDS, all of which dwarf the current mortality rate of Ebola, together with the many other day to day health issues that require medical support that is no longer available. 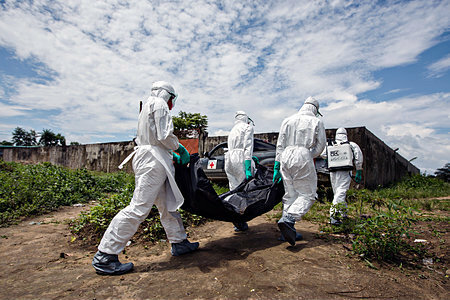 At best people who need such medical assistance may get cursory care but more likely there is no help available or worse they may end up alongside an Ebola patient. Add to this the effects of all these deaths on families and communities who have been left devastated by their losses, coupled with a breakdown of civic structures, major loss of employment from the many foreign companies that have shut down or reduced operations, and the widespread hunger, and it is easy to see how this humanitarian crisis is unfolding. Whilst Britain and other countries are now providing much needed aid and assistance much more is needed. The various charities and NGO’s operating in the region are equally doing a good job but the scale of the problem is huge. We have therefore launched our Ebola Crisis Appeal Fund to help alleviate suffering in the region caused by this crisis and provide much needed support to the local communities. Donations can be in the form of monetary gifts, with 100% of all monies received going to the charitable cause, or donations can be in kind (clothing, blankets, non-perishable food, toys etc.) which will be distributed utilising Westminster’s extensive infrastructure and networks. Please consider this appeal seriously and mention this request to your family, friends and acquaintances – the more we can raise on this appeal the more we can do to help alleviate the suffering. Details of how you may donate can be found on the Donate page available in the menu above. Or call +44 1295 756300 and mention Ebola Crisis Appeal and you will be put through to someone who will assist. Peter is married with 2 grown up daughters. One a scientist and the other an artist, which makes for interesting conversations and helps him keep a balanced view on what is needed to make and maintain healthy communities. Over the years Peter has been a trustee and chairman of a pre-school, a junior school parent governor and a trustee of a large independent church. He is currently an active member of his local playing field association and is a board member of Cherwell Community Land Trust, a charity that provides affordable housing and provides training and new skills for people wishing to build their own homes. He is also involved with a community outreach project in Banbury called the ‘Hill’ that is offering social and educational opportunities to young people. To keep himself occupied with the rest of his time, Peter is Managing Director of a company focused on delivering practical disruptive business solutions that reduce energy use and environmental damage. He is passionate about finding and introducing improved ways of thinking and working that provide benefits for the whole of our global community. Peter joined as a founding Trustee of the Westminster Group Foundation in 2014. Alan, married with a daughter, originally started his working career as a sports teacher, he later retrained and specialised in human resources and health & safety for a number of years. Latterly he managed his own textile retail business. Alan started his involvement with charity work at an early age and continued this through school, college, teaching years and beyond. In 1982 he joined Banbury Cross Round Table, where he subsequently held many positions including Chairman and was made a Life Honorary Member in 2005 for service to Round Table. He has also served as a member of a medical support charity at the John Radcliffe Hospital, Oxford for ten years, being their chairman for seven years. In 2004, Alan joined the Rotary Club of Banbury, an international service organisation. 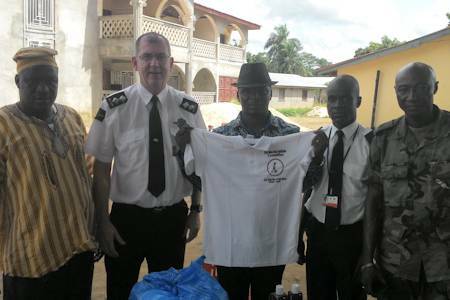 In 2005 he visited Sierra Leone as volunteer with the Rotary Mission Challenge team to build a hospital. He subsequently visited the country on nine occasions and has raised funds for the building and development of four schools and other much needed resources to these communities. In 2009 he was made a Rotary Paul Harris Fellow, this is the highest award given by Rotary Clubs for Rotarian’s and members of the public for exceptional sustained community service. In 2013 Alan was presented with the Rotary International “Service Above Self ” award, one of only 150 awarded worldwide that year. He became a Trustee of Goodwill & Growth for Africa UK in 2008. Since his first visit to Sierra Leone he has raised in excess of £211,000 for projects in the country. Alan will receive a Rotary “Champions of Change award” (one of only 12 awarded annually), with other Rotarian’s from across the country, at a ceremony hosted by the Lord Mayor of Cardiff in Cardiff City Hall in May 2018. Alan is a founding Trustee of the Westminster Group Foundation. Heidi has worked for the Westminster Group Plc since 1998 as the Group HR Manager. She is married with 3 children and is Chair of the Parent Staff & Friends Association of her children’s school as well as a member of the Schools Charity Ball Committee. She is a member of the local Parish Church Council and a Sunday school teacher. Over the last 20 years she has been involved with many charity committees and organisations. This week Westminster transported a container from the docks to the airport and under the supervision of Mick Oxlade the goods were unloaded and 100 boxes of donated goods will now be distributed. The REALLY good news is that the empty 20 foot container was taken to Calvary Community School for them to use as a secure storage facility freeing up a classroom that is currently being used for that purpose. A very excited and grateful Pastor Mark was over the moon with the news about the donation of the container. HUGE sincere thanks to Westminster Group PLC for this fantastic donation and for all their continued support. All that needs doing now is to offload it, but with no crane on the lorry in true Sierra Leone style you just get on with it. Health & Safety is a priority as you can see by the high visibility tabard. Quite a crowd gathered to watch but with supervision from Mick, Dickie, Shane & Moses of Westminster Aviation Security Services & Pastor Mark on hand what could possibly go wrong? These may not seem very exciting pictures to us, but for everyone at Calvary School this means so much. They can now clear the classroom and start using the container to store items. In September they will start using the classroom for education purposes. A really big thank you to everyone at Westminster Group PLC for this fantastic donation which will “make a real difference”. 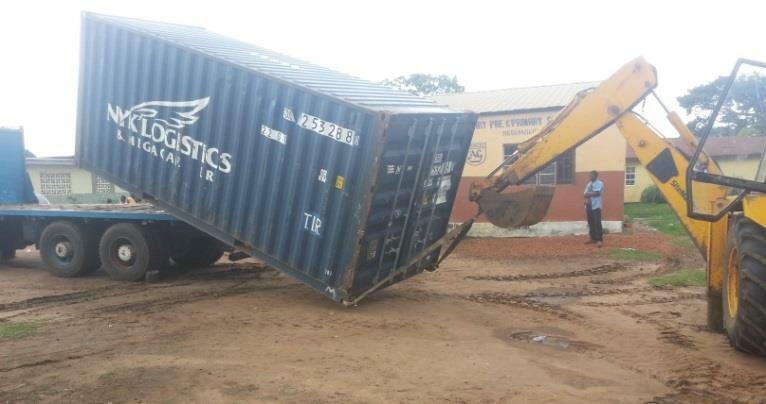 Westminster are going to be sending another sea freight container to Freetown in the next few weeks, the container is due in Banbury this week. They are willing to donate any spare space to Goodwill & Growth For Africa UK for items of humanitarian aid for my projects in Freetown. This is a great offer and Alan would like to express his sincere thanks to everyone at Westminster for this fantastic continued support.